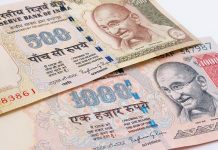 State-owned Indian re-insurer General Insurance Corporation of India Ltd’s (GICRE.NS) recently raised $1.8 billion in a public issue, making it the second-largest IPO in India’s history. 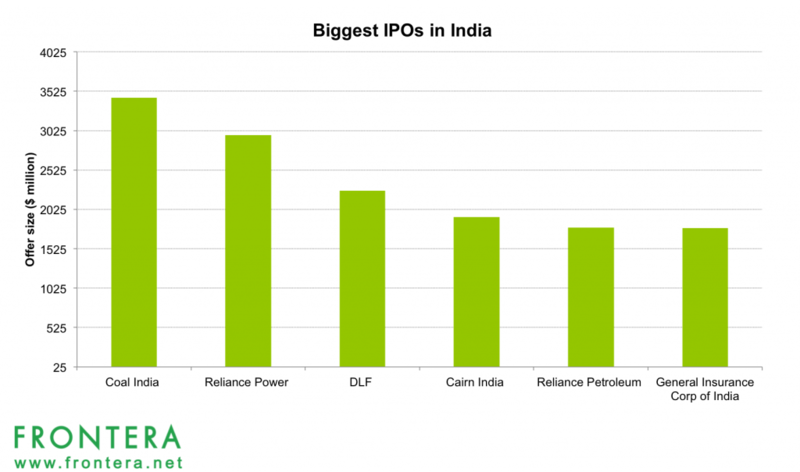 The largest IPO in India remains state-owned Coal India Ltd’s $3.4 billion (Rs15,200 crore) share sale in 2010. The government will offload 12.2% stake in General Insurance Corporation of India Ltd through 100.8 million shares while the company will sell another 10.7 million shares to improve its capital base. The company will offer a total of 14.2% of its post-issue share capital, or 124.7 million shares. Citi, Axis Capital, Deutsche Bank, HSBC and Kotak Investment Banking are the book-runners for the offer. 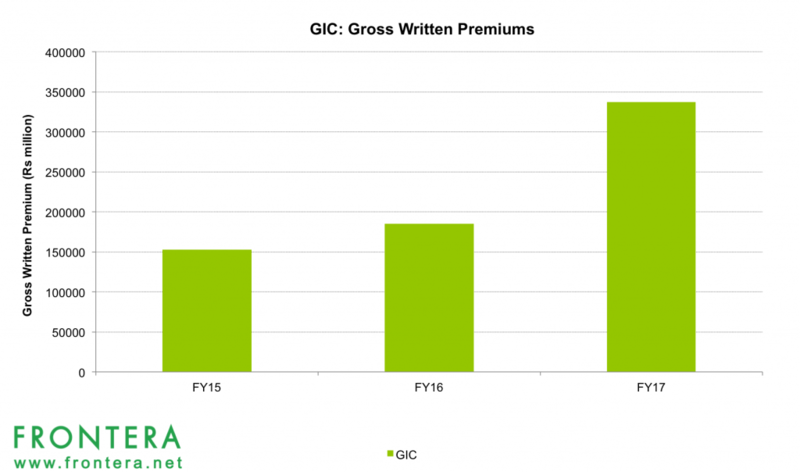 GIC has fixed a price band of Rs 855-912 per share for the issue, valuing it at $11.75 billion to $12.3 billion (Rs75,000-80,000 crore). The IPO was subscribed 1.37 times by retail investors. The portion reserved for institutional investors was 2.25x subscribed. Analysts are bullish on GIC in the long-term based upon the company’s solid fundamentals and fair valuations. At the upper price band of Rs 912 the stock is available at a P/E of 24.9x based on FY17 EPS of Rs 36.52. Indian brokerage firm Prabhudas Lilladher believes that the GIC’s price band of Rs885-912 per share implies a valuation of 25.7-27.4 times based on its March 2017 EPS of Rs 36.52 which it believes is a fair price. In terms of gross premiums, GIC is the largest reinsurance provider in India, offering its products in key areas like fire (property), marine, motor, engineering, agriculture, aviation, health, liability, credit and financial liability, and life insurance. The company accounted for 60% of premiums earned by Indian insurers in FY2017 according to CRISIL. Between FY15-FY17, the company’s gross premium (GWP) grew at a CAGR of 48.6%. In FY 17, the company reported GWPs of $5.2 billion (Rs 337,407.91 million) and a combined ratio of 100.2%. Year-to-date, the MSCI Insurance Index has surged 16% while the MSCI India Index has gained 23%. 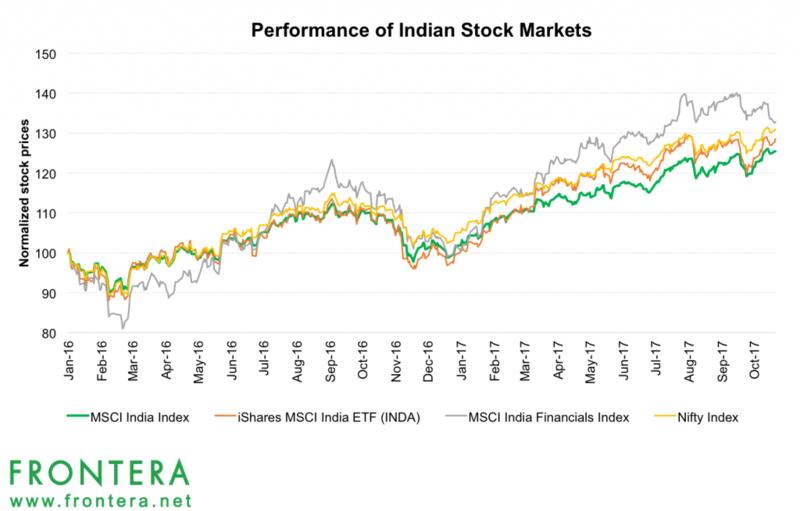 The iShares MSCI India ETF (INDA) invests 22% of its portfolio in Indian Financial stocks. For 2017 year-to-date, this ETF has returned 29%. Comparatively, the MSCI India Financials Index has returned 30% during the same period. 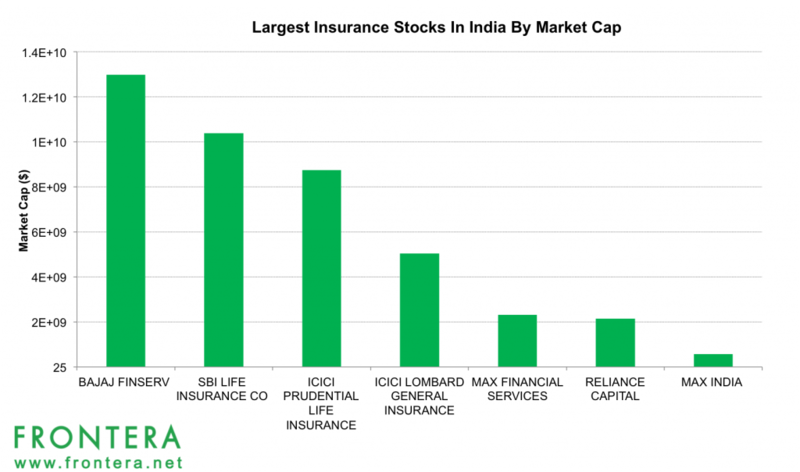 The largest Insurance stocks in India by market capitalization are Bajaj Finserv, SBI Life Insurance, ICICI Prudential Life Insurance and ICICI Lombard General Insurance. Currently, these stocks have market caps of $12.9 billion, $10.4 billion, $8.7 billion and $5 billion respectively. 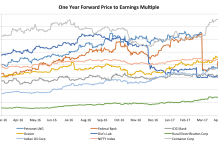 Year-to-date, shares of these companies have returned 74%, -6.3%, 29% and -0.2% respectively. Bajaj Finserv, is an India-based financial services company engaged in lending, asset management, wealth management and insurance products. The company is also involved in wind power generation. Bajaj Finserv operates through joint ventures and subsidiaries and has established a nationwide presence across more than 1,400 locations in India. Currently, it provides life insurance and general insurance products through its joint venture Bajaj Allianz. In FY17, the company was the second largest private general insurer in terms of GWPs, and is among the top 5 private life insurance providers in the country. 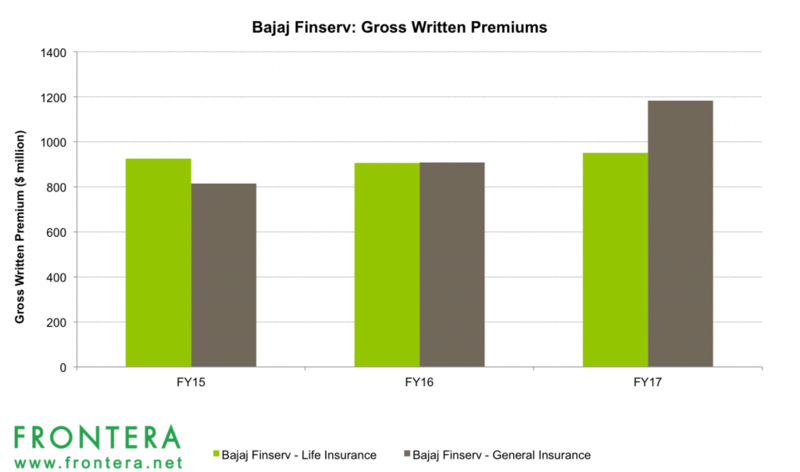 In FY17, Bajaj Finserv reported revenues of $3.7 billion and gross written premiums of $951 million in its life insurance business and $1.2 billion in its general insurance business. The company’s general insurance segment reported a combined ratio of 96.8%. Shares of Bajaj Finserv are listed on the National Stock Exchange of India (NSE) and the Bombay Stock Exchanges with tickers BAJAJFINSV.NSE and BAJAJFINSV.BO respectively. Year-to-date, shares of the company have returned 74%, outperforming the Indian benchmark index Nifty (NSEI). Comparatively, the Nifty Index has gained 26% in value in 2017 so far. SBI Life Insurance is a joint venture between India’s largest state-owned bank State Bank of India and French multinational bank BNP Paribas. SBI owns a 70.1% stake in SBI Life Insurance while BNP Paribas Cardiff owns 26% stake. Other investors Value Line Pte. Ltd. and MacRitchie Investments Pte. Ltd., hold a 1.95% stake each. SBI Life Insurance is a leading private life insurance provider in India. The Company’s individual plans include unit-linked plans, child plans, retirement plans, protection plans and savings plans. Its group plans include Corporate Solutions, Group Loan Protection Products and Group Micro Insurance Plans. 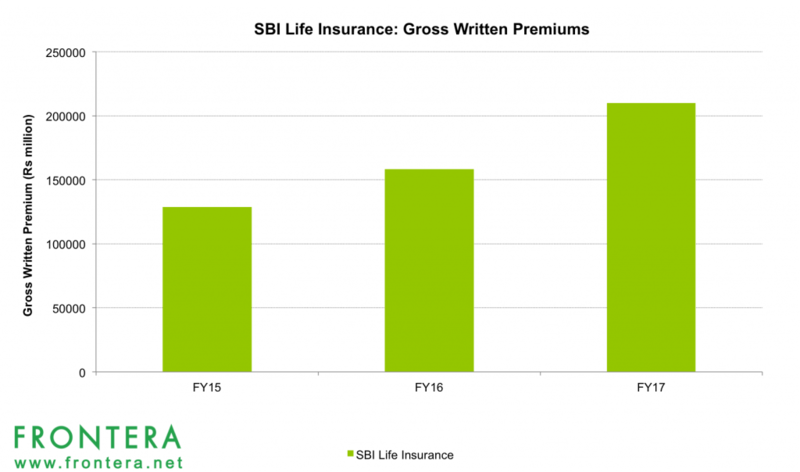 In FY17, SBI Life Insurance reported revenues of $158 million and gross written premiums of $3.2 billion. The company added 1.28 million new policies during the financial year. Shares of SBI Life Insurance are listed on the National Stock Exchange of India (NSE) and the Bombay Stock Exchanges with tickers SBILIFE.NS and SBILIFE.BO respectively. Year-to-date, shares of the company have returned -6.3%, underperforming its peers and the Indian benchmark index Nifty (NSEI). Comparatively, the Nifty Index has gained 26% in value in 2017 so far. ICICI Prudential Life Insurance provides life insurance in India. The company was formed in 2000 as a result of a joint venture between India-based ICICI Bank and UK-based financial services group Prudential PLC. ICICI Bank Ltd. and Prudential hold stakes of 68% and 32% respectively in the company. 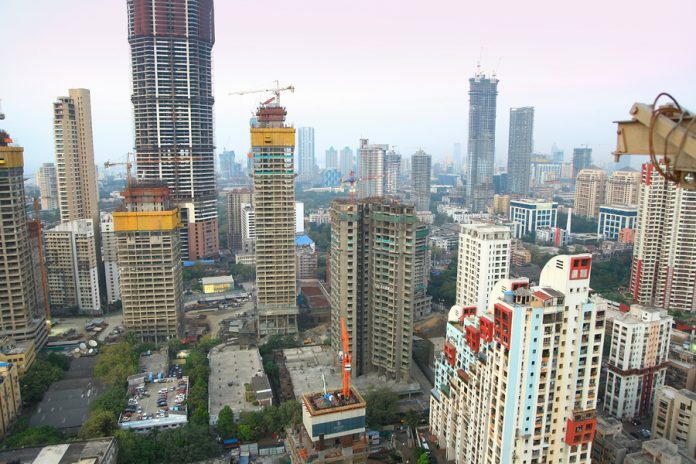 ICICI Prudential was among the first private sector insurance providers to receive approval from the Insurance Regulatory and Development Authority of India to operate in India. ICICI Prudential Life was the first private life insurer to attain assets under management of Rs 1 trillion and in-force sum assured of over Rs 3 trillion. In FY17, ICICI Prudential Life Insurance reported revenues of $5.8 billion and gross written premiums of $3.3 billion. ICICI Prudential Life was the first insurance company in India to be listed on NSE and BSE. The company’s shares have been listed on the National Stock Exchange of India (NSE) and the Bombay Stock Exchanges since 2016 with tickers ICICIPRULI.NS and ICICIPRULI.BO respectively. Year-to-date, shares of the company have returned 29%, outperforming its peers and the Indian benchmark index Nifty (NSEI). Comparatively, the Nifty Index has gained 26% in value in 2017 so far. ICICI Lombard General Insurance Company Limited is one of the leading private sector general insurance companies in India. Formed in 2001, ICICI Lombard General Insurance Company is a joint-venture between India’s second largest bank, ICICI Bank, and the Canadian financial services company, Fairfax Financial Holdings Limited. 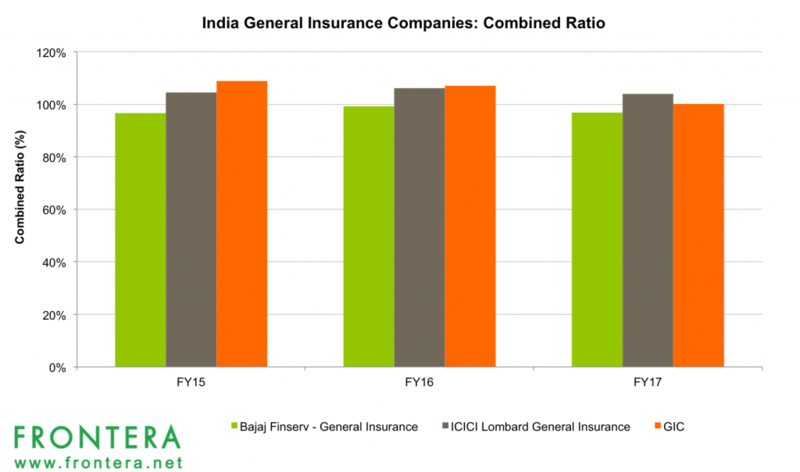 ICICI bank has a 64% stake, while Fairfax holds 35% of ICICI Lombard General Insurance. It is currently the largest private sector general insurance company in India with 249 branches spread across the country. 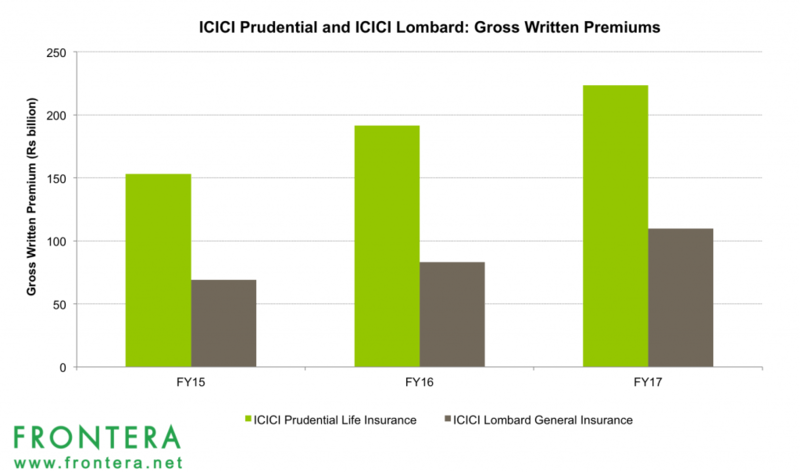 In FY16, ICICI Lombard reported gross written premiums of $14.9 billion and a combined ratio of 106.2%. ICICI Lombard’s shares are listed on both the National Stock Exchange of India (NSE) and the Bombay Stock Exchanges since September 2017 with tickers ICICIGI.NS and ICICIGI.BO respectively. Since their listing, shares of the company have returned -0.2%.